Due to these shared factors, the fear of first contact was significantly lower between these two societies than it was when Native peoples first met other European settlers. The Ojibwas and Finns worked together in forestry and fishing, lived together, and became friends. Some fell in love, had children and a new ethnic group was born: The Findians. Yet, they still have not been formally recognized. Similar to the Métis – descendants of European trappers and fur traders and women including the Cree and Ojibwa in Canada who have been recognized as indigenous people in Canada since 1982 – Findians are still campaigning for this status. Thanks to the three authors, we finally get to know the Findians. Meeri Koutaniemi’s impressive black and white photos show strong, determined individuals. 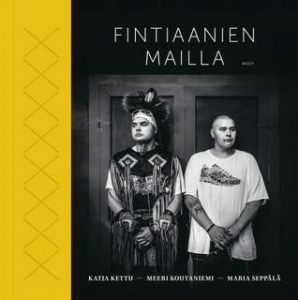 Supplemented by texts and interviews by Maria Seppälä and Katja Kettu, this thought-provoking book provides an overall picture of the current life of the Findians in which much of the Finnish language and culture has been preserved. In addition, it documents how their struggle for recognition is still shaped by poverty and exclusion. Hopefully, this book by the three Finns will help support the Findians in their fight for recognition. At the very least, a translation of this important book into English would be an important step to help them gain the recognition they deserve. I’d like to leave you with one small piece of trivia. An important descendant of the first Finnish immigrants is the American politician John Morton (1725-1777), who signed the American Declaration of Independence of 1776 for Pennsylvania. Now you can hardly get more American than that! After completing her M.A. in Scandinavian Studies and Finno-Ugric Studies both in Germany and Scandinavia, Dagmar Mißfeldt started teaching Swedish at Leuphana University Lüneburg in 1997. Her seminars focus on Sweden’s diverse culture and literature as well as language projects in collaboration with her colleagues. She also teaches Swedish and Finnish at Hamburg University and translates literature and films from Swedish, Finnish, Danish, and Norwegian into German.